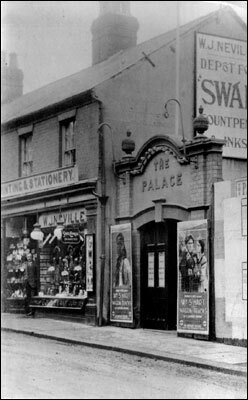 (left) Union Bank to the Palace c1910, perhaps Mr Neville in the shop doorway? 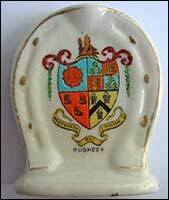 The business was started by William James Neville at the Green, Rushden in 1908. 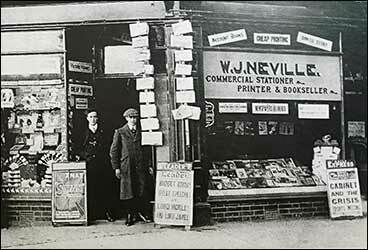 By 1914 he had moved into number 55 in the High Street (pictured left - between a cafe and the Palace Cinema), and they stayed until the shop closed in 1997. 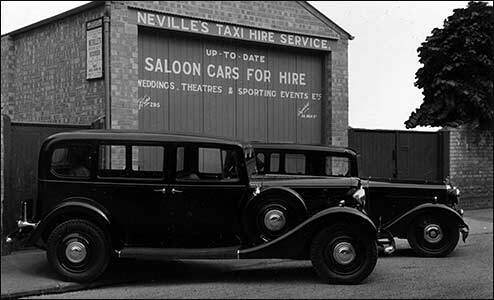 His son, Ross Neville, was born in the High Street premises in 1915, and he first ran a taxi business. A Commer 20 sealer built at the Waveney Coach Works, Lowestoft. 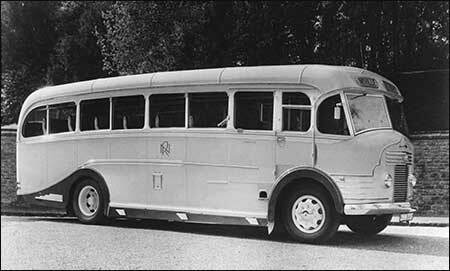 Ross advertised it as "Sunshine Saloon Coach for Hire". 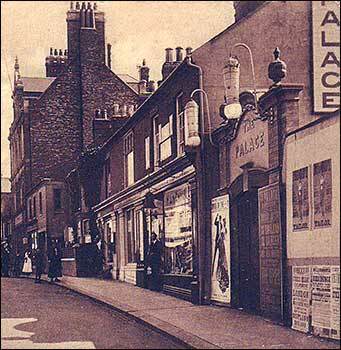 A trip to Great Yarmouth was about ten shillings. 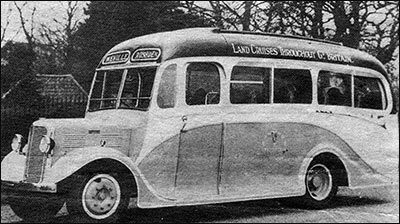 In 1938 he bought his first coach, a 20 seater, and ran trips to the seaside and out around the countryside. 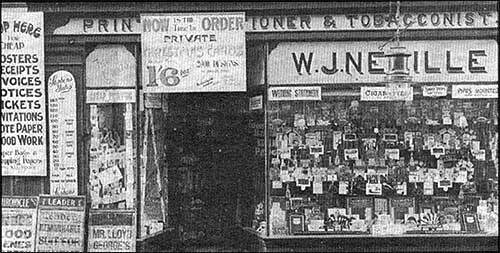 He ceased that business in 1953 when he took over the High Street shop from his father. He kept all the traditions of personal service, and he continued to weigh out tobacco and snuff using beautiful brass scales. 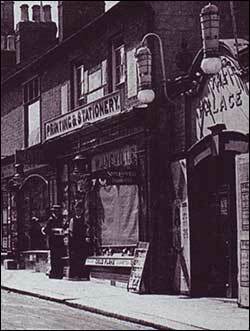 The shop was also a booking office for holidays & theatre trips. 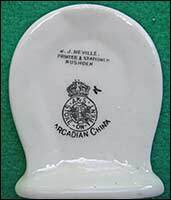 As the sales of rolling tobacco and pipe tobacco dropped with the introduction of manufactured cigarettes with filters, so the shop turned to new lines. The stationery side expanded with gifts such as fountain pen and pencil sets. 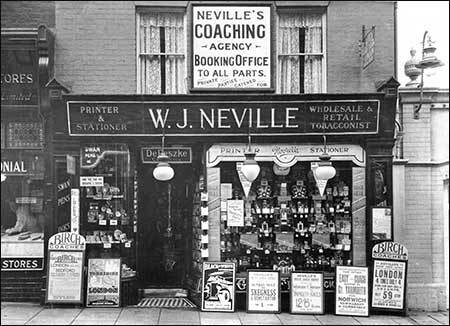 One of the oldest businesses in High Street, where the late Mr W J Neville traded extensively in smokers’ requisites, stationery and many other lines, is now extending under the direction of Mr Ross Neville, the founder’s son. Stock, display facilities and customers’ convenience have all increased, thanks to the rebuilding of the premises. The shop has now a roomy interior, modern set-up, but still presenting the friendly atmosphere of a family business. 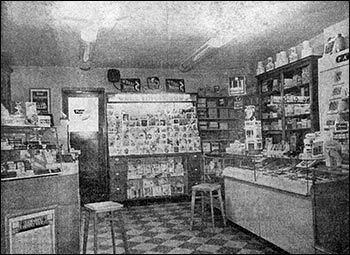 Ross’s son Roger joined the business in the 1970s and they expanded into the store behind the shop with a new line of greetings cards. The shop finally closed in June 1997 when Ross retired aged 82. They had an “offer we didn’t feel we should refuse” for the premises. Many of the original fittings were still inside the shop when it was finally cleared.